This story originally appeared in the Spring 2013 issue of Preservation magazine. Amanda Perez will be quick to tell you that the Maravilla Handball Court and El Centro Grocery have long been considered landmarks by residents of East Los Angeles. When Michi died in 2006 and Tommy the following year, the court and market were closed and boarded up. “Looking at it just tugged at my heart,” Perez says. So she and several others formed the Maravilla Historical Society and began reviving the site, now owned by the Nishiyamas’ son. But while the community considered the site a landmark, there was no official designation protecting it. And with the shaky economy and recent development in the area, residents feared for its future. So the Maravilla Historical Society and Los Angeles Conservancy teamed up to nominate the site as a state landmark. It also became part of the National Trust’s This Place Matters campaign. 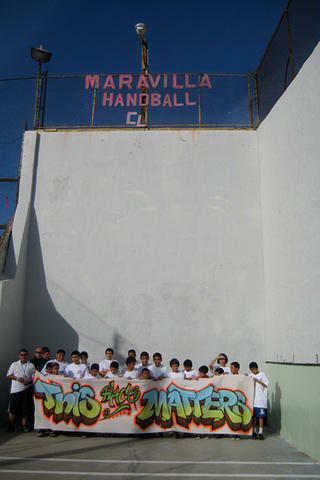 Restoration of the Maravilla Handball Court, the oldest remaining handball court in Los Angeles, began in 2008. In August 2012, neighborhood residents celebrated when the State Historical Resources Commission voted to list El Centro Grocery and the Maravilla Handball Court on the California Register of Historical Resources. With landmark status secured, the site hosts tournaments and lessons on the handball court, and art exhibitions, movie nights, and parties—such as the annual Dia de los Muertos celebration. In the future, she hopes to develop programming to address neighborhood needs, like access to healthy foods and programs for youth and senior citizens.